Yesterday my dear friend Amanda and I went to J.P. Licks in Harvard Square. Though I did settle on my favorite Oreo Cakebatter, I did want to try J.P. Licks' new Frozen Yogurt X (soon-to-be-named -- by you! ): "Tart, tangy, non-fat, refreshing, no cholesterol, less sugar, millions of probiotic bacteria..." Hm, sounds a lot to me like Pinkberry...I asked for a taste and the scoop girl kindly agreed. Fancy that! It was much sweeter than I remembered Pinkberry to be (read my previous post on my Pinkberry thoughts), and I didn't actually hate it! Actually, it was good, but the truth is, I would never ever walk into an J.P. Licks and order it when I am surrounded by rich, sweet, creamy real ice cream. Get Dirty and Help Save a Farm! Allow the ice cream and whipped topping to soften until spreadable. 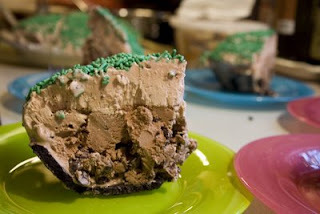 Cover the bottom of the pie shell with up to ¾ of the mint-chocolate chips. Stir the remaining chips into the ice cream. Spread the mixture into the pie shell, adding ice cream until you’ve filled to the top edge. Liberally cover the ice cream with the chocolate whipped topping. If you didn’t use all of the chips, sprinkle the remainder over the top with the green jimmies as decoration. Freeze the pie until solid (allow at least 12 hours between preparation and serving). If frozen solid, it will cut more easily with a heated knife. Makes 8 servings. Saves farms. Sounds pretty good. The Farmland Trust rep who sent the recipe and photos, tells me "While Preservation Pie tastes outrageously good, it’s not so pretty." Who needs looks when you've got taste? Here's to ice cream and good deeds. What could be finer? Photos courtesy of Lancaster Farmland Trust. Sitting home happily solo Sat night I decided to catch up on some DVR'd Food Network shows. Knowing the husband would roll his eyes at watching these episodes I took full advantage of being just me to check out some of Food TV's stars takes on ice cream. First stop, Giadda's Everyday Italian. Could she make it look any easier! Seriously why when I make ice cream do I always seem to have spilled cream everywhere, egg shells in my yolks, and of course some sort of scrambled egg mixture in the end (I am still learning!). So she hyped me up into making her Chocolate-Hazelnut Gelato. 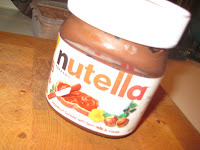 Actually it truly was the jar of Nutella that did it. I tried it tonight for the first time and it really is one of the best things on earth. I can just image in a Nutella anf fluff sandwich or Nutella and anything for that matter. 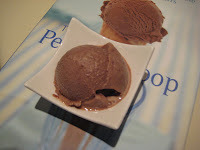 Okay back to gelato...Giadda's recipe actually is as simple as she makes it look so its worth checking out if you are into making your own ice cream, or gelato in this case. Oh and if you are new to this like me, you might be interested in what makes gelato different from ice cream...my findings found that its the fact that italian ice cream(gelato) has more milk than cream and less air making it denser and richer. Whereas american ice cream uses a higher fat content with more cream than milk. I have found recipes to really vary but this is the lowdown on italian vs american. If anyone has a more thorough answer feel free to forward it along as my research was rather short and sweet. Actually Giadda actually explains this quickly in the beginning of the episode which was helpful. Next morning... :( icy and not the creamy texture that Giadda's looked like. No clue what went wrong but it was my first try at making gelato. My husband actually really liked it although he thought it was very sweet but it definitely didn't meet my expectations. Oh well..practice makes perfect I guess. At least I discovered Nutella in the process and now have a new BFF! Try it out...Giadda made it look awesome and I'm stil learning so don't take my word for this recipe yet! Place a strainer over a medium bowl and pour the warm custard mixture through the strainer. Stir in the vanilla and hazelnut spread until it dissolves. 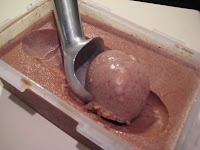 Chill mixture completely before pouring into an ice cream maker and follow manufacturer's instructions to freeze. To serve, scoop gelato into serving bowls and top with hazelnuts. Mystic CT, a true New England town tucked along the CT shore known by the infamous movie Mystic Pizza, delivers much more than just pizza. It goes way back to the shipbuilding days of the 1600s and is packed with quaint shops and restaurants , a beautiful coast, boating activities, world-class museums, and best of all....homemade ice cream shops. It is New England, and where there is a small town there is bound to be a small local ice cream shop somewhere. And here they were not hard to find. So come Victory Day, a random holiday only teeny RI would still celebrate (along with Hawaii), the family had two goals, the Mystic Aquarium and ice cream, of course. Loved the aquarium, so did the little one but it was hard trying to dodge the kids with their generic ice cream pops. I knew there was something so much better down the road at the seaport so I came up with every con to get my daughter to just wait. Now for a three year old that is like pure torture because anything that resembles ice cream is good to them. Luckily I succeeded and we went on our hunt for the real thing. mint was fantastic but I couldn't really taste any mocha in the other. But I think that's what I get for mixing the two together. The mint definitely took over. Regardless I would go back. It was awesome! As for the others, Holly always goes for Oreo with sprinkles which was good and typical and Scott's favorite is Rum Raisin, which you don't often find at shops, so he was pleasantly surprised to get it here. It actually had thick swirls of rum-infused sweetness and lots of raisins. Not my cup of tea but he raved about it. Worth noting though are a couple of their crazy flavors like Sticky fractured Finger, now doesn't sound tempting but its caramel ice cream with pieces of butterfinger and caramel swirl...YUM! Seriously why didn't I get that one, and another was Jamaica Me Nutty, chocolate and coffee ice cream with pecans, almonds, and walnuts...more reason to go back! So as the rain bore down on us we nestled into this shop and waited out the storm with heavenly scoops from Mystic's best ice cream shop. I say that loosely because I did see another homemade ice cream shop across the street that I have yet to try but it surely was great and worth the wait. What to do with too many cookies to eat oneself? I know it sounds like a real bad problem right?! But I hate to throw them out so I took my first shot at making some ice cream sandwiches. I also had my favorite Edy's Slow Churned Take the Cake ice cream in the freezer so with two main ingredients I was on my way to a sandwich to love. Step 2...insert inverted chocolate chip cookie and add two scoops (with the awesome Pampered Chef dipper, it really is one of the best I have owned...and no I am not a consultant!) on top, pressing firmly. Top with second cookie. Step 3...invert the sandwich maker, press the cylinder to squoosh the cookies together and to secure both ends to the ice cream. My cookies were not quite the size of the press so ice cream oozed out the edges but I quickly took a knife and trimmed it down. Results...what's better than a sandwich of chocolate chip cookies and ice cream. It's super easy to make with or without an ice cream sandwich maker gadget and kids of all ages will love helping or just eating. Next time you have extra cookies and have some ice cream on hand, try it out. It's fun to eat, easy to make, and you can freeze and have on hand for a couple months. 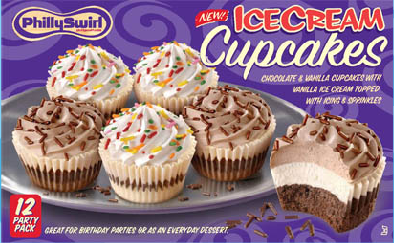 A while back we got an email asking if a PR firm for PhillySwirl could send us samples of their new ice cream cupcakes. We wrote back and said "No, we don't like ice cream or cupcakes." Yeah, right. Of course we jumped at the occasion! After we went back and forth coordinating when the cupcakes could be delivered, the delivery finally arrived on the doorstep on Wednesday. Box arrived at 10:30ish. (Good thing I saw the FexEx truck though. The driver didn't even ring the bell.) Box was well labeled. I won't let this go bad! Box contains a styrafoam cooler filled with dry ice. Here is the twelve pack I receive. Put this in the freezer and wait patiently for husband. Husband being husband is more interested in the dry ice. So before eating, we play. (probably how one would get them at a non-Costco type store). The box that arrived held two six packs, each of which had three cakes with chocolate cake bases and three with vanilla cake bases. Other than that, they were the same. The cake base was dripping with chocolate sauce (that was now frozen, so not runny), then topped with a disc of vanilla ice cream, a swirl of chocolate and vanilla frosting and sprinkles. Heaven. Did I like them? Yes. A lot. 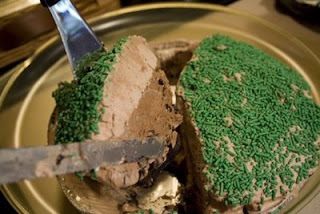 The cake was dense and rich and balanced by the creamy ice cream. The one thing I didn't like was the frosting, to no fault of PhillySwirl's. The frosting reminded me of a whipped cream frosting, which has never been something I have been a fan of. I am a buttercream girl all the way. Easy remedy for me though...I could just take it right off. My husband enjoyed the little cakes too. He said "They were good!" He thought the frosting tasted of marshmallow -- marhsmallow or whipped cream tasting, he liked it. Taste is in the tongue of the beholder, I guess...! When visiting our new puppy on Saturday, a couple of friends tried the vanilla-based ones as well and enjoyed them very much. One of the friends was surprised at how moist the cake was. I agree. It really was very moist. I had never heard of PhillySwirl before the initial email, and when I went to their website, it became clear to me: their products aren't readily available in Massachusetts, which is really too bad, because I could see myself picking them up occasionally. I love the idea of ice cream cupcakes, but the actual making them wasn't my favorite thing, if you recall from our Cupcake Roundup. The site did say they have them seasonally at Costco, so I will have to keep my eyes peeled when I visit. Oh, and as with the general feedback from our own homemade ice cream cupcake collection, these are messy to eat. But all the more fun to be covered in ice cream. Tina's review will follow soon. We have a winner from the Onesie Cone-test! Congrats to Christine! 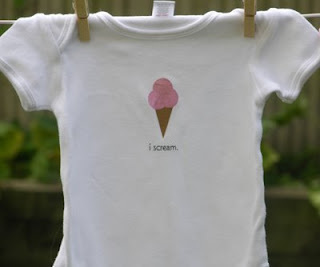 Christine's favorite was the white onesie with the pink cone. 73% of you preferred the white onesie and the remaining 27% of you preferred the pink onesie. This was not, however, without tons of wonderful suggestions, ideas and comments. Thank you! I will be attempting to make different colors, styles, etc. based on the feedback. I think my first order of business (based on the feedback) is to make some more unisex versions...maybe a mint colored scoop or lemon?